Renal Feline is a complete food for cats that suffer from chronic renal insufficiency or hepatic encephalopathy. It is specially formulated to support and maintain healthy renal function while reducing oxalate stone formation. Phosphorus retention can lead to secondary hyperparathyroidism and can also lead to renal failure, so this food has a very low phosphorus content to prevent phosphorus retention. Omega 3 long chain fatty acids will help to support a lower glomerular pressure which will help to prevent GFR (glomerular filtration rate). An increase in uraemia often causes the development of gastric or intestinal mucosal ulcers. This will be prevented with added FOS and zeolite. 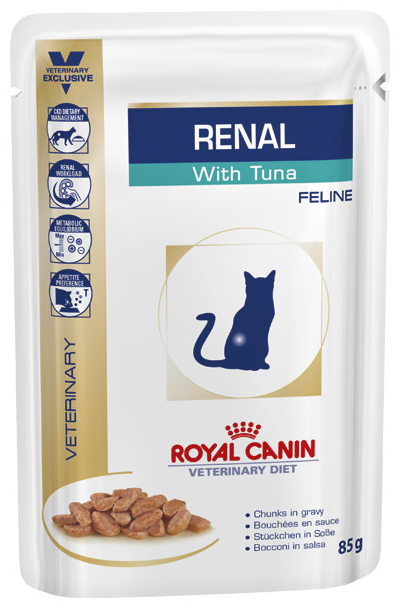 Additionally, the food contains a special synergistic antioxidant complex which will help to boost your cat's natural defences, neutralise free radicals and maintain healthy cells and DNA. Complete dietetic feed for adult cats. 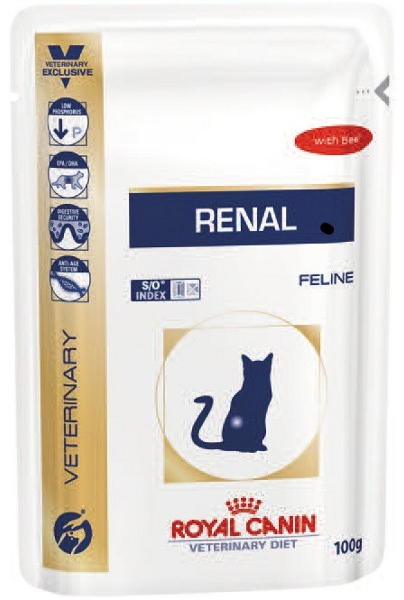 RENAL with Beef is a complete dietetic feed for cats formulated to support renal function in the case of chronic or temporary renal insufficiency, through its low level of phosphorus and high quality protein. Meat and animal derivatives (pork, poultry, beef 4%), cereals, oils and fats, eggs and egg derivatives, derivatives of vegetable origin, minerals, various sugars. Meat and animal derivatives (pork, chicken 4%), cereals, oils and fats, derivatives of vegetable origin, eggs and egg derivatives, minerals, various sugars. Meat and animal derivatives (pork, poultry), cereals, fish and fish derivatives (tuna 4%), oils and fats, derivatives of vegetable origin, minerals, various sugars. Vitamin D3: 350 IU, E1 (Iron): 9 mg, E2 (Iodine): 0.4 mg, E4 (Copper): 2.5 mg, E5 (Manganese): 2.7 mg, E6 (Zinc): 27 mg.
Vitamin D3: 350 IU, E1 (Iron): 11 mg, E2 (Iodine): 0.4 mg, E4 (Copper): 2.5 mg, E5 (Manganese): 3.4 mg, E6 (Zinc): 33 mg.
Vitamin D3: 320 IU, E1 (Iron): 13 mg, E2 (Iodine): 0.13 mg, E4 (Copper): 0.9 mg, E5 (Manganese): 4 mg, E6 (Zinc): 40 mg. Protein: 6% - Fat content: 6% - Crude ash: 1.1% - Crude fibres: 1.3% - Moisture: 80% - Calcium: 0.2% - Phosphorus: 0.08% - Potassium: 0.19% - Sodium: 0.09% - Essential fatty acids: 1.7% including EPA/DHA: 0.45%. Protein: 8% - Fat content: 8.5% - Crude ash: 1.1% - Crude fibres: 0.8% - Moisture: 75% - Calcium: 0.14% - Phosphorus: 0.09% - Potassium: 0.3% - Sodium: 0.12% - Essential fatty acids: 2.6% including EPA/DHA: 0.55%. Protein: 6.5% - Fat content: 6.7% - Crude ash: 0.9% - Crude fibres: 1.4% - Moisture: 79% - Calcium: 0.2% - Phosphorus: 0.09% - Potassium: 0.19% - Sodium: 0.1% - Essential fatty acids: 2.5% including EPA/DHA: 0.45%. Formulated to support renal function in case of renal insufficiency: high quality proteins and restricted levels of phosphorus. Contains EPA + DHA and antioxidants. Very high energy density which provides daily energy requirements in a reduced feeding volume. Complete and balance liquid diet to support nutritional restoration and convalescence of dogs and cats requiring assisted enteral nutrition. Milk and milk derivatives, cereals, oils and fats, vegetable protein extracts, minerals, derivatives of vegetable origin. Source of protein: low-lactose milk, caseinate, soya protein concentrate. Crude ash: 0.9%. Crude fibre: 0%. Crude oil fats: 5.5%. Moisture: 85%. Protein: 7%. Vitamin A: 3330 IU, Vitamin D3: 320IU, E1 (Iron): 30mg, E2 (Iodine): 0.3mg, E4 (Copper): 1.8mg, E5 (Manganese): 2.4mg, E6 (Zinc): 28mg, E8 (Selenium): 0.15mg. 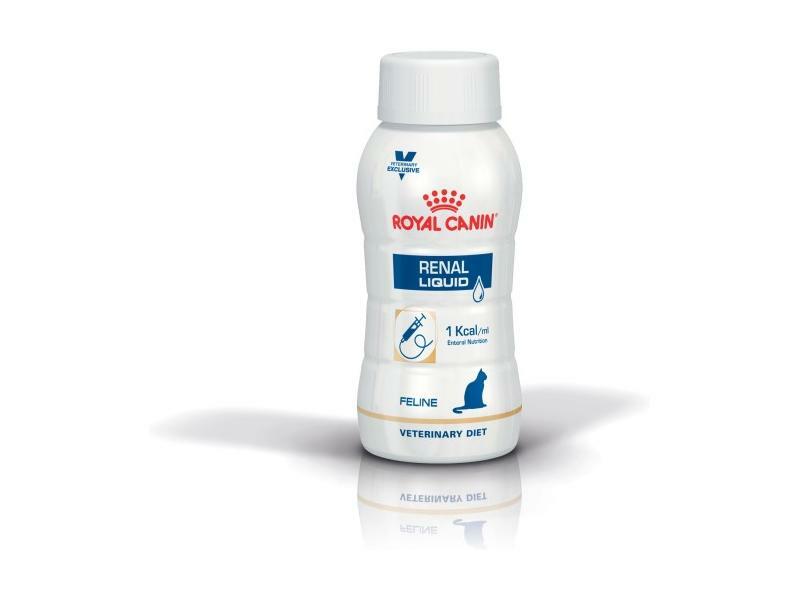 There are currently no questions for Royal Canin Feline Veterinary Diets Renal Wet Cat Food - be the first to ask one!